Gets the Mission Well Drilling Cost ONLINE! Mission area property owners should have full access to the current water well drilling costs without the need for high pressure sales visits. If you're comfortable with our detailed water well estimate we can then schedule a time for Doug to stop-by and visit your property, he will provide a FREE water well consultation and answer any questions you may have without obligation! Please provide your information in the well drilling estimate request form, provide as much as you can so that we can prepare a detailed estimate quickly. Please submit your information, we'll respond quickly. Your information helps up provide a more complete and detailed well drilling estimate for the Mission area.... thank-you! Water Well Drilling Mission is highly focused on premium water well service providing quality water well drilling throughout Mission and the local area, we proudly serve the neighboring communities of Mission, offering a high-standard of water well systems to our local property owners. Water wells in Mission are very significant in everyday life as hundreds of families, farmers and local businesses depend on groundwater resources and local aquifers throughout the area. 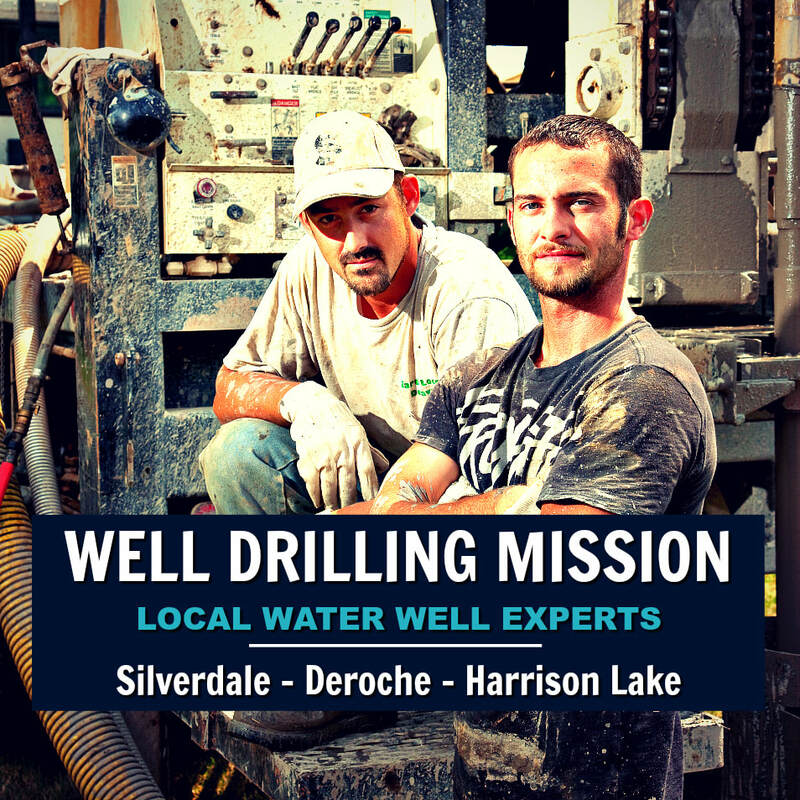 Water Well Drilling Mission offers a full-range of local well drilling and water well pump services from Whonnock to Harrison Lake. We complete all projects to a high-standard, our specifications often exceeding the normal acceptable standards within the Fraser Valley water well industry. Mission Well Drillers rely on their extensive experience and specialized knowledge of the local areas when drilling water wells in the countless sub-surface and extensive range of geological environments when developing local groundwater resources. Substantial experience and knowledge is necessary when drilling for water in the Mission and the surrounding area for the successful completion of quality water wells. Excessively deep drilling may result in difficulties or even the possibility of the unwanted intrusion of saltwater in some areas as well as creating exorbitant water well drilling costs. Water Well Drilling Mission gives water well drilling priority to the Mission area including Silverdale, Steelhead, Hayward Lake, Durieu, Hatzic, Miracle Valley, Dewdney, Nicomen Island, Deroche, Lake Errock, Harrison Mills, Hemlock Valley, Harrison Hot Springs, Agassiz, Ruskin and Whonnock. Our drillers are very conscious of the cost to drill a well in Mission, we never take advantage of property owners and always aim to locate the best possible fresh water resource on your Fraser Valley property. Water Well Drilling Mission is diligent and will make every effort to avoid dry-hole drilling or the costly and sometimes the unwarranted necessity for the hydro-fracturing of local water wells. We earnestly appreciate the value of top-quality water well drilling and the importance it provides to local properties for a long period of time. The assessment of real estate can be affected by the lack of an acceptable water supply or a sub-standard water well. Mission water well drilling is completely upfront, we refrain from well drilling practices not in the best interest of our customers or the neighboring properties, we value integrity and work-hard to delight our customers. Water well drilling Mission is highly-equipped to perform at any level that may arise, providing exceptional domestic drilled wells, commercial well drilling applications, or large-diameter irrigation or production wells for our local agri industry. We do specialize in residential well drilling in Mission but we're completely equipped to install water wells in any formation including remote well drilling locations that utilize our Heli-portable HT-500, HT-700 and our HT air-compressors. For the larger drilling projects, our DR-24 Barber drills can install wells from 6” to 22” diameter and up to depths of 1,000 feet! Water well drilling Mission has innovative drilling equipment, with the ability to perform the most specialized of drilling projects. Including the capability to modify existing drilling equipment to meet specific well drilling requirements. Our customers welcome our capability and qualifications to fully manage their water well projects from drill to faucet, eliminating many of the typical and costly well drilling hassles experienced by people who much prefer the ease of a one-stop local water well service. Our specialized abilities combined with our local well drillers and other experts, is what sets us apart from other well drilling companies in Mission. People often recognize through experience that the highest-standard of well drilling is absolutely priceless. Throughout any given year existing wells in Mission run dry completely, dry well drilling is often preventable had the workmanship been performed to a better standard from the beginning. Sub-standard water wells often go hand-in-hand with low-bidding and drilling practices that are not of most property owner’s expectations when they choose to contract with a low-bidder. The results can be disheartening at best with water well problems such as quality, possible ongoing contamination issues as the result casing leaks, and even low-flows that may have been prevented by a highly skilled journeyman water well driller. These are just a few of the water well problems that can severely prevent property owners from enjoying the benefits that a quality drilled water well would bring to a property owner. At the end of the day low quality well drilling is very expensive and often disruptive for many water well owners. The water well drilling industry is a costly industry enter and operate profitably, it's difficult for a single owner-operator who often wears all the hats to survive let alone thrive in the industry. As Guidelines and BC Well Drilling Regulations improve, skills and well drilling equipment often doesn't. When a well driller is lacks the ability to pay for skilled trades or operating with inadequate financial backing, it’s the local property owner's needing a drilled well who generally ends up paying a price they did not expect. Drilling shortcuts, old equipment and poor drilling practices can frequently result in projects completed to a less than satisfactory standard. Water well drilling estimates can easily be manipulated, often property owners agree to well drilling contracts based on the lowest-bid per cost per foot to drill a well, this is NOT the way to contract with a reputable well drilling company in the Mission area. Reputable well drillers never bid low, they bid fair and they perform a job on your property that is extremely important. Sometimes, small neighborhood operators will low-ball the Mission well drilling costs just to keep his aging well drilling rig limping along to the best of his ability and the unsuspecting often fall prey... I've seen it time and time again. While most people would appreciate the fact that anyone should have the ability to do business any given marketplace, should that be the case if it's to the detriment of the customer or public health? 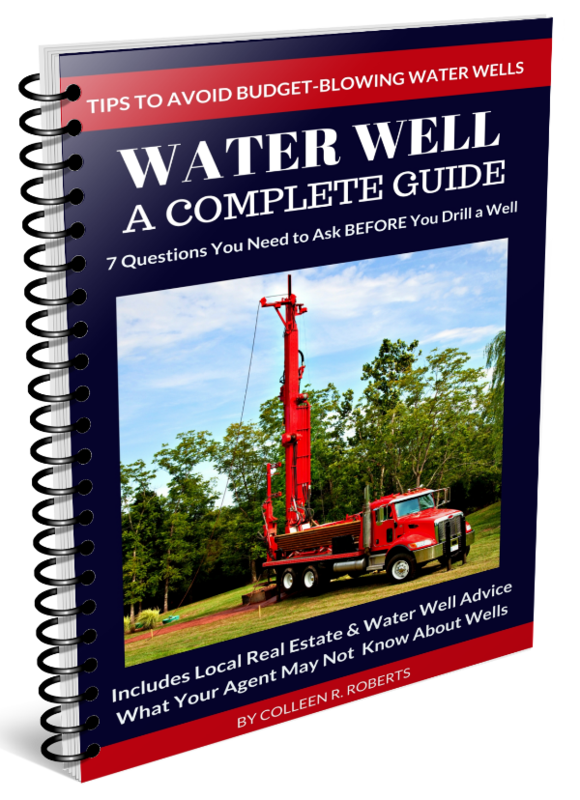 When it comes to well drilling many property owners come to regret not making a more informed decision prior to hiring a water well driller. Because of the high cost of operating a well drilling company, single owner-operators may sometimes lack the ability to manage well drilling problems as they frequently occur, or the expertise required to tackle difficult well drilling situations on local private properties. There's more that goes into drilling a water well than most property owners realize, it requires good equipment and a team of highly skilled trades people. As a result, water well construction problems maybe concealed or not mentioned during the drilling and installation process or even upon invoicing. If water well repairs in Mission are eventually required, it will be costly at best to do any required repairs if even possible. It would not be unusual for people to unknowingly consume contaminated water for years prior to discovering they have a contamination issue with their water well in Mission. After 25-years of groundwater consulting in British Columbia I've sometimes noticed that a well owner might find it difficult if not completely impossible to get their under-financed, low-end driller to even return a phone call, let alone warranty any water well problems that were created when the well was installed. There is tremendous benefits that come with quality water well drilling, you will NEVER regret quality. Regardless or where you might live be careful when contracting to drill a well, ask for the history of the well drilling company, the well driller, and the drilling team involved with your project. We are happy to provide our clients with this information! Some of the older well drilling rigs are not operating with up-to-date equipment or properly maintained, often leaking excessive hydraulic fluids that can rapidly contaminate a well drilling site or even the water well itself. Whether you're drilling a water well in Mission or the surrounding area you should only contract with a highly-reputable well drilling contractor that's fully equipped to manage ANY well drilling issues that could arise while drilling for water on your private property. With any well drilling method in Mission, the permeability of the formation around the borehole is reduced. For example, in the cable-tool method, compaction and clay smearing occur. With wet-rotary drilling, fluid infiltrates the aquifer and when reverse circulation is used, water laden with fines often obstructs the formation as a vacuum effect occurs around the bit. 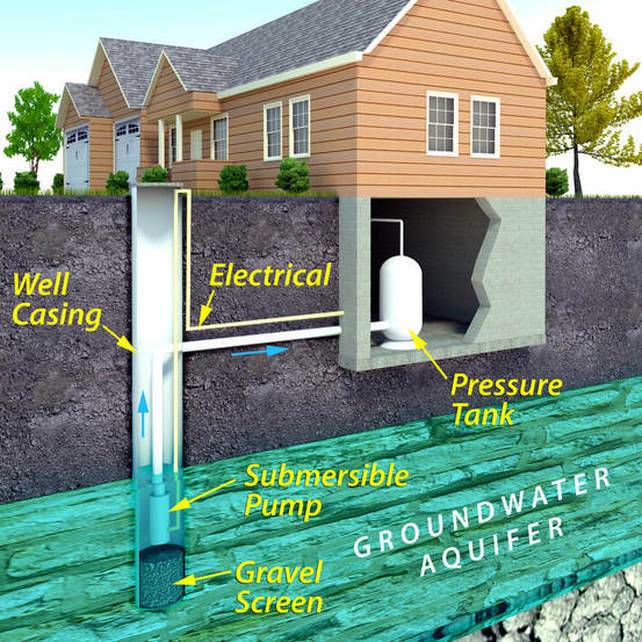 Knowledgeable water well development in Mission is demanding and critical to any quality water well completion to maximize the efficiency of the well by rehabilitating the aquifer after the disruption of the water well drilling and installation process. Fine particles surrounding the well screen must be removed from the area to increase the permeability of the aquifer, the use of air and our unique surge methods at Mission Water Well Drilling greatly enhance our water well development procedures! Well Drilling Mission are specialists at water well screen design, the careful selection of a well screen is, without doubt, the most important consideration in producing an efficient water well. A properly selected well screen will be designed to serve two basic purposes: to permit unobstructed entry of clean water free from sediment into the well, and to permit a maximum flow to the formation for development procedures. "Water Well Drilling Mission is transparent and up-front with our well drilling estimates, we refrain completely from drilling practices that are not in the best interest of our clients or their neighbors, we greatly value integrity and work diligently to delight our customers!" If you have any questions, please contact us. We return all phone calls promptly, we're here to serve you and our beautiful Mission communities. BC Ministry of Environment WELLS Database Mission provides water well data for Silverdale, Steelhead, Hayward Lake, Durieu, Hatzic, Miracle Valley, Dewdney, Nicomen Island, Deroche, Lake Errock, Harrison Mills, Hemlock Valley, Harrison Hot Springs, Agassiz, Ruskin and Whonnock. The WELLS Database for Mission and local communities is regularly updated and managed by the British Columbia Ministry of Environment. The provincial government's iMapBC is an important online portal to a wealth of open government data for the Mission area. A valuable local water resource, WELLS Database Mission is a self-serve system, free of charge and available for public use. Along with the British Columbia Water Well Regulations, Resources and Mission Water Well Search Tool, you'll also locate the provincial land-use requirements, setbacks, Fraser Health Links, Water Rights Database BC and other water well information with down-loadable reports and website links. Well Drilling Mission, Well Drilling Regulations for Mission and communities, Canadian Drinking Water Guidelines is included in the official WELLS Database Mission Water Resource Library hosted by Water Well Drilling Mission. Not all water wells are drilled deep in the Mission area, many wells may be less than 200' in depth, if located near possible sources of contamination a well can become contaminated and possibly cause serious illness. To locate comparable water well drilling depths in your Mission neighborhood and Ministry of Environment set-backs please refer to all local resources including well drilling reports, resources are available at British Columbia Water Well Search and local community bylaw offices. A water well drilled in Mission or any of the surrounding communities should be located on higher ground when possible to protect the well head from normal or seasonal flooding and possible surface drainage. Shallow wells and deep wells in the Fraser Valley can be vulnerable and should always be located away from surface drainage ditches and other potential sources of contamination. Check Water Well Drilling Environment Groundwater & Bylaws in your Mission Community.